Killer Karts, the arena, no skills for the drivers as a 'get to know the rules' game. We each entered from different walls (#3 North, me East, #4 South, #1 West) with everyone but me at 20 mph; I was at 10 mph. Sons #1 and #3 make a run at each other at low speed (~30 mph) and chew up each other's front armor, using a lot of ammo. Son #4 is approaching their position. I am puttering along at 10 mph, drifting past obstacles. Sons #3 and #4 make a few head-on shots at about 30 - 40 mph as they close near the center area of the map. Son #3's front armor and MG iare chewed off and his power plant takes a few hits (no fire). Son #4 has his front armor greatly reduced, but they are passing each other. Then Son #3 pulls a 90 degree turn and T-bones son #4 into an observation tower. The impacts destroy Son #3's power plant and lightly injure him and he is stopped. Son #4's left armor is torn off but he is still armed, dangerous, and doing 30 mph. Son #1 is in the northwest corner, I am approaching from the east at 20 mph. Son #3 decides to get out of his car and run for a tower. Son #4 then pulls off a bootlegger's! Halfway through the maneuver Son #3 starts getting back into his car. Then Son #4 come to rest facing son #3 (who is dead stopped and unable to move or fire) at about 3.5". Son #4 fires but misses with a 3! Unfortunately, Son #4 is now at a stop 4" dead ahead of me with no cover and his unarmored side facing me. I snap off a burst, roll lucky twice, and Son #4 is dead. Son #3 gets back out of his car and runs for a tower. Son #3 is cowering by the entrance to the central tower as I vector in on Son #1 , who is in the SW corner trying to pull off the 'build speed, maintain a good handling, and not hit something' trick. Son #1 realizes I am about to corner him and floors it. I am up to 40 mph but he is at 70 mph. I prepare to keep turning inside and control the center until he is forced to either come at me with his damaged front armor or I can get in behind him. As I and Son #1 are heading to the SE part of the map Son #3 begins moving. Soon he is at Son #4's car where he jumps in and begins starting the (still armed, still functioning) killer kart! In the NE corner I almost get Son #1 trapped but he (once again) floors it and my 4 long range shots, all Hail Marys, all miss. About this time Son #3 realizes I am almost in position to rake him along the side with no armor he dives out of the far side of Son #4's car and runs for the tower again. I let him go so i can focus on Son #1. Pretty soon we are in Turn 25 and Son #1 and I are still lapping the arena. While he has never been in a position to even fire at me with any hope of success, he has been keeping his speed and distance up so I really can't get him, either. Son #3 is still lurking by the tower but has no real hope of starting and using Son #4's kart. It is very late so Son #1 and I agree to call it a draw. "Dad, I expected to play this game every now and then to share a game with you, but this turns out to be the most fun boardgame-type thing we own that wasn't made by Lew Pulsipher by hand." The sons all want more than karts so I informed them we will do vehicles up to $10k next time (total cost - Son #3 wants body armor and a personal weapon!). Son#3 (at least) will be designing a new vehicle. Where can I find a nice download of all the important charts?! What other maps, etc., do people recommend? And what other rules should I acquire, since this is a hit? Not a real review, but just the comments of me and my sons as we have read through the books. Me: "The artwork is really good. The binding is very nice." Ja. : "The books certainly are gorgeous." A.: "I love the artwork." S.: "Very pretty to look at, at least." N.: "The art is nice and the last picture in the PHB is a badger, so bonus points." Me: "You don't need multi-classing anymore since you can take various options to various classes to emulate a multi-class, which is interesting." Ja. : "Looks like they have cleaned up a number of monsters." A.: "Turns out that being almost-dead might actually have longer term effects than just the next long rest." S.: "Random dungeon creation charts are back, which is great." N.: "The various tables to help with motivations and background might lead to directions you'd never consider without help." Me: "...and yet you can multi-class, at least as an option, so let the min/maxing and 14 levels ahead character optimization begin anew!" Ja. : "Monks can get an hadouken? What the?" A.: "I've already figured out a way to get multiple spells off in a round and I've only had the books 15 minutes." S.: "I should be third level after the 3rd or 4th session? So we'd have retired 2, maybe 3, 20th level character parties in just the Blackstone campaign?" N.: "They nerfed golems? Who nerfs golems?" Me: " Where do the credits acknowledge Runequest, Rolemaster, HackMaster, and Castles & Crusades 'for their contributions to the "new" content of this book'?" Ja. : "If you want something for nothing and think character death is a horrible event that should never happen this is the game for you." A.: "I don't want to play this, even to playtest." S.: ""The DMG reads as 'we're sorry that 4e destroyed your creativity - here's some charts!'" N.: "They nerfed badgers? THEY NERFED GIANT BADGERS?! This game is dead to me." Full review in a few weeks. I met my lovely wife in August of 1990 just before I left for the Gulf War. The very first thing we did for fun was play the old WEG Star Wars RPG. I thought she was a long-time veteran of RPGs. it was actually her first RPG session, she had just memorized everything about the Star Wars universe. - The Mysterious Amazon, a barbarian mistress of the spear who was one of the deadliest fighters in Lew Pulsipher's campaign world. - Lady the Abbess Gabrielle, a paladin who dual-classed into cleric and went on to name-level. - Stardust, the very best thief in my Blackstone campaign. She has a strong preference for fantasy RPGs with AD&D 2e S&P being her flat-out, must have a campaign running, favorite. She prefers to play front-line fighters with cleric/paladin a close second and loathes playing mages. And she has never, ever, not once, ever dungeon mastered a single game. After a few weeks of prep (it is the Christmas season, so she's busy) she ran a simple encounter to get her feet set. To prep the Wife used the 1st level dungeon random encounter tables and followed the random rolls to arm, equip, etc. the villains. She stated very clearly that this was a 'practice round' [i.e., no permanent death, no treasure, no experience]. She asked that we play only the Big Four (fighter, cleric, magic-user, thief) with no specialization, custom classes, multiclasses, etc. Me: Thrain Ironhand, 1st level dwarven fighter with an 18/91 strength and 13 hit points. Bardiche, heavy crossbow, splint mail for protection. Ja., the oldest son: Justinian the Great, 1st level human magic-user with Charm Person. A dagger and happy thoughts for protection. A., the second oldest son: Legas, 1st level half-elven thief with really good pick pockets. Short sword and a bajillion daggers with leather armor. S., the third son: Otto, a 1st level halfling thief who is as silent and stealthy as a shadow. 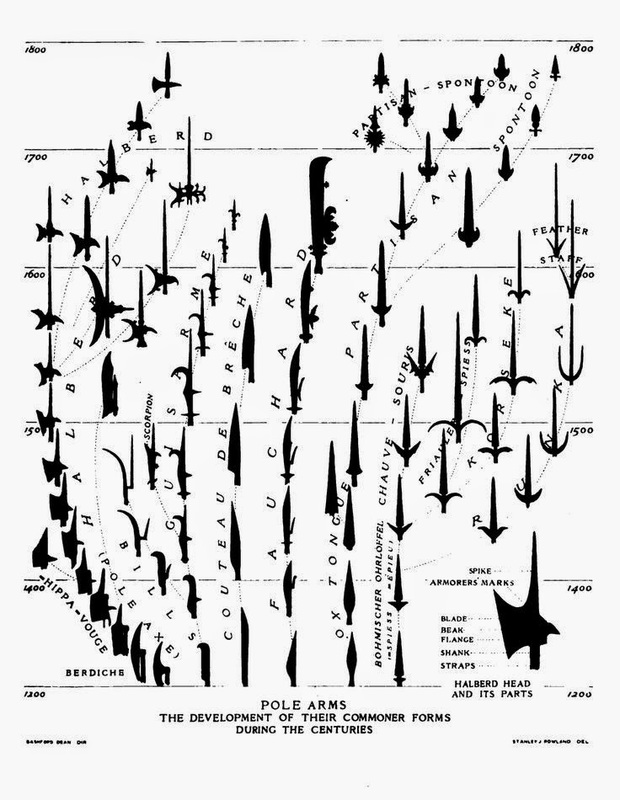 Dagger, club, and leather armor. N., the fourth son: Bill, 1st level human cleric with a fiery faith. Heavy mace, warhammer, chain and shield. and looked right into the eyes of one of the three hobgoblins eating friend chicken around a table. No one was surprised so Legas dove into the room through the window, trying to keep the hobgoblins from blocking the door. Thrain, seeing, this, charged up and smashed open the door. In the first round the hobgoblins (with broad sword, spear, and long sword) all missed Legas and Thrain missed. Justinian held his fire, watching the door to to back of the cabin. Otto tried to stealthily open a back window and failed. Bill stood by to step into melee as soon as Thrain could press in. In the second round Thrain slew the broad sword wielder in a single blow and stepped up to engage the spearman. Legas missed and was cut down by the long sword wielder, alive but bleeding out with -1 H.P. Bill rushed in and engaged the long sword user. Otto failed to stealthily open the other shutter. In third round Otto smashed open a shutter and saw a human cleric sacrificing a chicken at an altar to Maglubiyet as a hobgoblin with a spear rushed him. Otto threw his club at the cleric, hitting for minimum damage but disrupting the ritual. Otto promptly fled for the front. Thrain wounded the spearman, the longsword user wounded Bill, and Bill missed. Justinian threw his dagger at the long sword user and missed. Fourth round! Thrain missed. The spearman grazed Thrain. Bill missed. Otto arrived. The longsword wielder hit Bill. Bill goes down, slumping over the body of Legas. At this point Legas is at -3 H.P. and Bill is at -2 H.P., also bleeding out. Otto steps up to fight the long sword user as Justinian scrambles to retrieve his only dagger from the corner. Fifth round. The long sword wielder cuts down Otto, who falls next to Bill and Legas at -2 H.P. Its looking like a TPK at this point. Justinian flees out the front door as Thrain cuts down the spearman. Sixth round. Thrain misses. The long sword wielder hits, bringing Thrain down to 5 H.P. Legas is bleeding out at -5 H.P., Bill is bleeding out at -4 H.P., Otto is bleeding out at -3 H.P. The magic-user is ready to sprint away, the long sword wielder is fresh as a daisy, and there are reserves behind the door. Seventh round. Thrain hits and kills the long sword wielder. The jerk. Justinian prepares his spell. Eighth round. Thrain smashes open the door to the back room where the cleric has just finished strapping on his plate mail. Justinian hits the cleric with Charm Person and the foe blows his save. The last hobgoblin, seeing the devastation and that his master has gone all wobbly-headed, dives out a back window and flees. The Wife rules that the charmed cleric saves the lives of the downed members of the party and we wrap up. All in all it was a great first session. Varied enemies with different H.P., different weapons, etc. We all loved playing the session even when it was grimmest. 1) The storytelling was easy and fun for her, but the mechanics was more involved than she expected. 2) She realized how important reacting to the actions of the players is and that too much prep might result in trying to force the players down the "right" path. 3) It is shockingly easy to wipe out a party. 1) The thing most likely to kill a low level party is the armor class of the enemy. Hobgoblins are A.C. 5 so the mage needed a 17 to hit them - that's one hit out of 5 attempts. Even Thrain, a dwarf with a total of +3 to hit (strength and racial bonus) needed a 12, hitting only 45% of the time. Even though 2 of the hobgoblins in the main combat only had 2 H.P. and the 'tough' one only had 6 they were so tough for 1st level n00bs to hit they almost wiped out the party. 2) The thing second most likely to kill a low level party is the number of attacks facing the party each round. Low level parties have the terrible combination of poor armor classes and low hit points. Each extra attack per round increases the odds that a character goes down that round. 3) Low Hit Die Monsters are, one-on-one, tougher than low-level characters. A hobgoblin has 1+1 HD for an average of 5.5 H.P. Only as tough as a first level fighter, right? Wrong. His to hit roll is the same as a 3rd level fighter. A hobgoblin is, in effect, a 2nd level fighter. A- Fighters are physical offense. B- Magic-users are magical offense. C- Clerics are magical and physical defense. D- Thieves are scouting and intelligence. These are all very, very true at low levels where players haven't had a chance to 'buffer' their roles with magic to add some flexibility. When the thieves got into front-line battle they died. While the cleric did his best to hold the line, he died. When preparing an encounter for low-level parties calculate 1 melee foe per fighter +1 melee foe per cleric +1 melee foe for everyone else. Example: With the party above I would have calculated 1 hobgoblin for Thrain, one for Bill, and Justinian, Otto, and Legas would be just a single additional foe, for a total of 3 hobgoblins. Trust me, this will be enough. For a tough challenge add a spell foe for each mage and a spell defender for each cleric. Same Example: Tossing in a witchdoctor adds spell offense and spell defense. These are really rough guidelines and YMMV. And, yes, it is about 5 NPCs. Earlier entries in this series are here, here, here, and here. You can juuuust see where the Patchwork Lands are on the map. Again, I want a BIG world, so each square is (at the equator, etc.) 1,250 miles wide/high. The equator is marked with a dashed line placing the Patchwork Lands in roughly the same latitudes as France, so I have a weather/crops/etc. comparison. Here is a bit of a zoom in on the world near to the Patchwork lands. To discuss scale - the Sea of Grass, a vast grassland (obviously) penciled in there that covers the majority of the continent of the Patchwork Lands, covers about, oh, 18 to 19 million square miles. That is larger than all of Asia, or three times larger than Russia, or 5-6 times larger than the US, or 200 times larger than the UK. That means the lake in the Sea of Grass is larger than the Caspian Sea. That also means that the largest lake on the big map is larger than India. So my focus when I get to conveying the world to the players is to allow them to discover that while the Patchwork Lands are going to have a 'look and feel' very much like Medieval Europe plus magic the larger world, and it is very large, is vast and full of mystery. I will need to have fantastic things far away, legends of distant lands, and merchants, etc., discussing just how far away things are. If done well, it will want them want to travel. If done poorly they will feel like underpowered yokels. I also need to think about how these huge distances will affect trade, travel, and politics. Hmmmm. Hi, everyone. Sales of Far Realms over the Thanksgiving weekend were better than I expected. Of course, I didn't expect many people to buy it. I mean, it is good but there are a lot of good books out there! Anyway, to continue the sale I now have a 10% discount on the print version of Far Realms and when you buy it you get a link for the PDF at 50% off. I used to read a lot of comics. As I recall between 1974 and 1988 I had somewhere between 12 and 22 subscriptions at a time and would purchase more, as well. I really dropped off in sheer volume in 1988 and virtually stopped by 1992. I do still read them, but selectively and often collections of classics. Why the change? Two main reasons. There was a tone of moralizing in comics from the time I started, a sense that the writers were interested in telling you what you should think rather than telling you a fun story. Green Lantern/Green Arrow was a (very, very) obvious example of this. For me the last straw was the death of the character Doug Ramsey - killing a character that drove good stories to send the message 'guns're bad" was terribly annoying. Don't get me wrong, I understand that DC had some issues with their lines. I personally can recall owning various comics that told completely conflicting stories of what happened to Superman's parents after they launched his rocketship, for example. Add in that the list of 'last survivors of Krypton' was up to a few million and, well, sure. But a strict continuity means that you are forced to jettison fun stories because they don't fit. Here is an example of a story arc that I owned and loved. A powerful foe appears from space. Superman uses all of his strength but, in the end, Superman dies. After the death of Superman the earth is in chaos but a 'replacement' Superman uses his powers to take over through threat of force. But the real Superman was only mostly dead; an aient revives him with yellow sun radiation and, reinvigorated, the real Superman deals with the replacement and reveals him to be a fake. It is the iconic 'Death of Superman' arc, right? Nope. This was all done in two issues of World's Finest in 1977, a full 15 years prior to that famous arc. Let me repeat and expand; in two issues of a comic Superman dies, a fake Superman creates a world-wide dictatorship, Superman returns to life and overthrows the ruler of the entire world, and not a single other comic from DC mentioned it, then or ever. And why not? After all, it was just a comic book, right? But with strict continuity this would be impossible, even in a 'side franchise' comic like World's Finest whose bread and butter was super cavemen and weekly alien invasions. The original goal of continuity was to create opportunities for more and even better stories. Now the goal of continuity is continuity and it now drives out more and better stories. That is why I like Squirrel Girl. Don't know who she is? Look her up. Better, look up the list of villains she has beaten. And she's beaten them in canon so that it is part of continuity. I love the character because it takes the starch out of the strict continuity types. So [to throw out a bone to the TRPG nature of the blog] Just like you can't let the status quo prevent your campaign from advancing, don't be a slave to continuity, either, as long as the changes aren't to harm or railroad (too much) the party. Focus on fun - after all, we are playing games. 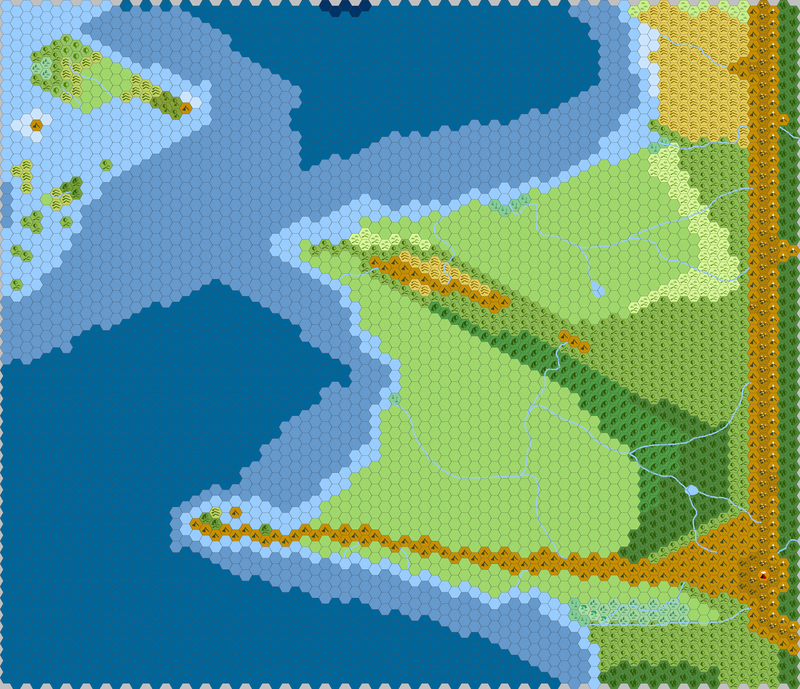 This is the result of a bit of doodling on Hexographer. Each hex = 9 miles/3 leages. I haven't done any smoothing nor added any towns, cities, etc. Or roads. My dear wife, whose marine biology studies in college involved a LOT of work in marshes, likes the swamps, etc. Next time - world maps! Labels: campaign, map, Rolemaster, world building, Worldbuilding and You! This item and its concept was created by my oldest son, J. The sage Sassendal was rightly famous for his in-depth knowledge of the celestial bodies and their motions. His insights into their secrets earned him fame and wealth including a great gift from an adventurer - several pots of pigments that, when used to paint an image, made a duplicate of that thing depicted. Sassendal had used his wealth to finance the construction of a new armillary, one that he hoped would be not just the most comprehensive but the most accurate. The master craftsmen had completed the globe of Yrth (Sassendal's home world) as well as the bands for the sun, the moons, and the various planets. The sage gave the pigments to the master limner who had been hired to paint the surface of these globes and bands with the coasts, mountains, and rivers of the entire world or the various colors and patterns associated with them all. When the limner completed the Yrth globe he was astonished to see a brief flash as it was covered in movement: a film of clouds was visible over the miniature world! Equally surprised, Sassendal observed as the limner likewise used the magical paint on the bands of the sun, the planets, and the moons. As each was completed it seemed to flash into movement across its surface. When the last band, that of the sun, was complete it burst into light, glowing as if it were a miniature sun! The The various bands leapt into place around the mounted Yrth globe and began rotating in a perfect simulation of the celestial motion. Further, the Yrth globe accurately shows the weather of the entire planet (if it is a bit small). 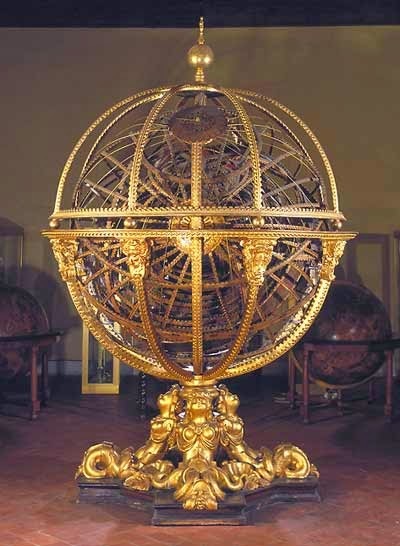 Sassendal was able to use the armillary for even more accurate work with the celestial objects and could further warn of typhoons and other great storms, earning him even greater wealth and fame. Since Sassendal's death the armillary rests in the Royal Library. 1) +5/+25% on all skill checks related to stars, moons, the sun, etc., including any sage knowledge checks. 2) All divinations cast within 10' of the armillary have their duration and range increased by 50%. 4) Anyone observing the armillary for 5 or more minutes can predict the weather for the next 48 hours with 80% accuracy.This check may only be made once a day per person. 5) The armillary sheds true sunlight in a 60' radius. 6) by using the various levers at the base a person can adjust the armillary to see the past or future locations of celestial objects allowing the very accurate predictions of solar eclipses, lunar eclipses, etc. The armillary returns to showing the present 1 minutes after such examinations. The armillary is 7' tall and weights 1,000 lbs. It makes all saving throws as hard metal at +3. -A Diviner has caught a glimpse of a future catastrophe and wants access tot he armillary to confirm his accuracy, but the royal librarian demands the hide of an ice fox in return for access. -The Royal Astronomer summons the party to the library. Advancing the controls to show 2 weeks into the future the armillary suddenly a falling star appears from the wall of the library and moves to the miniature Yrth, striking near the very kingdom you are in! The party has 15 days to think of a way to stop a falling star! Since I have my Big Ideas that Drive Things and major locations for weird and for plots (see the previous two posts) I want to nail down local geography in the main campaign region a bit more. The broad brush history outline is that a large human empire collapsed under outside attack long before the time of the campaign start and that the main area, the Patchwork Lands, survived because of serious natural barriers. So I roughly sketch out a peninsula isolated from the main continent by forbidding mountains. I will have it be East-West oriented with a north to south of about 300 miles north to south and 300 miles east to west plus the longer peninsula on the southern edge. The total area will probably end up being about, oh, 100,000 square miles, or roughly the size of South Korea/Iceland/Colorado and about 1/3rd the size of Italy. While the world is vast I do want to start on a slightly smaller scale to drive into the players that they are small fish in a rather large ocean, so this is good. Plus, as I have mentioned before, 300 miles is a very long way in a fantasy world. With no cities, a few outposts of elves and such, and otherwise - howling wilderness full of things you build large campfires to scare away. North of that is the Sea of Grass, a vast plain 3,000 miles or more east to west, 2,500 north to south with just a few rivers breaking up grassy prairie twice the size of all of Europe. East and South of the Vast Forest will be other collections of small nations who, like the Patchwork Lands, are recovering from the vast war that destroyed the empire that once ruled this area. West will be an archipelago with a small number of city-states in a nod to Vance's excellent Lyonesse series. Now that I have 'filled in around the edges' I am almost ready to start filling in the regional map. But first! I will need to drill down and add more detail to races. That is for next time. Part I of my series on how I am creating a new campaign world is here. So now that a broad sketch of world history is done, the core ideas of the world are gelled, the races and professions are in place, and the concepts of the primary adventuring region are in place (as discussed in part I) It is time to get to adding in the details that make place memorable. One thing I like to do is make a few memorable geographic features so that I have some places to mention in everything from my narratives to the contents of old books. I do this on a macro scale (the entire world) and a local scale (the regional area of the campaign). So I glance through the broad outline of history I made and note that the original home of the first High Men was lost when a magical/something cataclysm sank an entire continent. Why an Atlantis? because I have never, ever done one before. Heck, there is a Lemuria, too. But instead of having the entire thing be lost and the very idea be mythical I placed an island, an Ireland-sized one, in the midst of that vast ocean I mentioned previously. The tallest peak of that drowned continent became this island and it is still occupied by the last descendants of the first High Men. I wanted to have a 'weird place', a nexus for the strange and unusual so I placed a large plateau in a distant mountain range, wrote up some basics on the strangeness that congregates there, and dubbed it 'the Plain of Glittering Lights'. I will later put something relatively plot-important (a magical academy, library with rare tomes, lost city, etc.) on or near the Plain to entice players to risk a trip there. The main campaign area will be on the western edge of a cluster of three continents and (mentioned in part I) I want the eastern edge of this cluster to be dangerous enough to almost force the players West. Why, you ask? To make places like the Plain of Glittering Lights more remote and legendary! Doing it this way will make it easier/more explainable why low-level parties stay within the campaign area while high-level parties travel more freely. I have the continent holding the campaign area come very close to the next continent - few miles, at one point. Then I flank this narrow strait with large volcanoes and call it the Gates of Fire. I additionally call the oceans around this area the Hot Sea and describe how underwater magma and hot springs make the ocean almost boiling hot. The next continent south of these is mainly jungle, swamps, and mountains. In addition to giving me a great place to place lost cities of the jungle I also put a lot of Orcs with ships along the coast, meaning that sailing anywhere near is dangerous. This Corsair Coast will be dangerous at low levels, a great source of adventures at medium levels, and a nuisance at high levels. Maybe one more big place. one more location or thing that the entire world would know of. I am a big fan of Clark Ashton Smith and recall his short story, the Isle of the Torturers as being wonderfully atmospheric. So, well East of the main campaign areas (and the barrier I placed, above, I put the Isle of the Sorcerers. If you aren't aware, in Rolemaster the Sorcerer class is infamous for spells like, oh, Break Limb and Long Soul Destruction, so they aren't pleasant, in general. So with just a bit of thought I have a handful of Big Name locations that serve and both plot elements and something for the players to remember ('Isle of the Sorcerers' is a lot more memorable than 'that distant archipelago with one large island'). Sometimes things get out of hand. This weekend I was joking around with the kids and I mentioned that they might meet the hirelings/potential henchmen known as the Guisarme brothers - Bill and Glave. By Sunday afternoon it had expanded to their friends Bill Hook, Hal Bard, and Becky Corbin. I hope to have a new, free, supplement up soon of full writes ups of all five as NPCs for OSR games by Friday. If you don't already know this, I have 5 sons. 4 of them are old enough to play RPGs and, for some odd reason, they love 'em. Anyway, for many years I talked about how much I enjoy Rolemaster so, about 4 years ago, the 5 of us started acquiring Rolemaster FRPG and we soon had, essentially, All The Books. The kids read the rules, the kids love the rules, so - time for a game or two! Place the adventures in either Blackstone (my 8 year old AD&D 2e campaign world) or Seaward (my 35+ year old AD&D 1e campaign)? Use an packaged campaign world made for Rolemaster? Just sort of let a campaign world grow from the bottom up as we play? Engage in a bit of world building? For those of you who don't know, Rolemaster has a lot of classes, a lot of skills (especially RMFRPG), a lot of types of magic, and a lot of races and cultures. While this means there is a great deal of flexibility in what you can put into a world it threatens analysis paralysis - so many choices you never choose. To overcome this I decided to do a high-level description of the world, pick an overall tone, throw in a "shocking" concept critical to the world and its development, and limit the classes and races a bit as first steps. So I started by limiting playable races to dwarf, halfling, elves (wood, grey, high), half-orc, half-elf, and human (common, high, and mixed) (all cultures from the core book and Character Law). NPC races I limited to all listed as Subterranean, the Orloc, and the Quishad. The Fey also exist. So gnomes, kobolds, orcs, etc. are out there but no lionmen, wolfmen, reptilemen, etc. as full blown races. Hidden pockets of them may lurk about, but they are going to be mythical/legendary at best. I'll admit: I didn't limit classes very much at all! I mainly kept the semi-spell users and hybrid magic users to the 'most common'. For overall tone I wanted to whipsaw around a bit. As I have mentioned before Blackstone has a 'manifest destiny' feel to it with the players in a powerful Human kingdom as it starts expanding against neighboring evil nations. Seaward is largely a 'frontier outpost' setting with the characters in a small, remote kingdom trying to defend the innocent from marauders. So I want the new campaign to not look too much like either but have plenty of room to adventure. I decided the PC-level setting will look like the Italian City-States - many small nations, in relatively close proximity, with intrigue, politics, and such but also a wide mix of cultures, plenty of chances to travel, and the like. As i sketched out what the local map would look like (which includes enough mountains, thick forests, etc. for plenty of monsters!) I decided on the name the Patchwork Lands for both the regional map and the campaign. But I also decided that the overall setting is going to be much more of a 'Lost Ages Past' world, hopefully evoking an overall aura akin to Clark Ashton Smith's Zothique Cycle. So I wanted everything to have a feeling of being very, very old and of the world being very, very big. To start with, I made the planet physically huge - double the Earth's diameter, as a matter of fact. Gravity will be the same (well; the creatures that live there all act normally, how's that?) because I'll-figure-that-out-as-I-go/magic. The world map clusters a few continents together and then has three more scattered about. The continental cluster will be Very Dangerous on its east and have a vast ocean (as in '20,000 miles across at its widest' vast) to its west, creating a situation where the scattered continents are 'lost in legend' distant from the campaign center. The 'feeling old' part is tough, so I shelved it for a few - along with the 'shocking concept' because nothing had hit me as of yet. So I had very rough sketches of a world map and a regional map, a gigantic world, and a desire for things to have the weight of ages upon them. Looking at the races I noted that several (elves, orlocs, quishadi, black orcs) are immortal and some (notably high men) live a very long time. There was a not in the Creatures book that orlocs 'existed in the long ages before men' and 'created the quishad' at which point I had an idea that led to the shocking concept (well - two related concepts). I started blocking in a long history covering more than 300 million years (most of it in very broad strokes, obviously). but throughout the history the world is marked with the appearance of new, intelligent races and with some of these races suddenly becoming immortal or (in one case) very long-lived. Each race that becomes immortal faces an inevitable decline. This is one of the two shocking concepts - virtually all of the intelligence races on the world are from elsewhere, mainly arriving from other worlds via space travel, some created by science or magic. The orloc, for example, came in a colony ship. The elves from a scout ship, the humans from a heavily-damaged ship that had a jump drive malfunction (a ship that is still in orbit!). Dwarves from a parallel dimension, etc. Halflings are the result of scientific experiments on humans, orcs the result of magic experiments gone wrong by elves. The other concept - this large, old, odd planet attracts these visitors, draws them in because of the powers and spells of the vastly old, almost completely forgotten natives of the world, the super-intelligent reptile-men that ruled the world for half a billion years before vanishing two full Ice Ages ago. Facing a world of no offspring they struck a foul pact for immortality, unaware that the cost was a loss of their essential racial vitality. The races that learn of the reptile-men are drawn to their centers of power and allowed to bargain for favors. Creating bargains similar to the very one they, themselves, made the reptile-men offer gifts, knowledge and, eventually, immortality. Those races that choose immortality give up some little part of their species' long-term vigor to the reptile-men. The humans that became high men were suspicious and 'just' took long lives, limiting the damage. Eventually, over eons, the reptile-men will have enough of whatever it is that they are gathering to return to their world full of the vigor they, themselves, traded for immortality all those hundreds of millions of years before. This 'backdrop' allows me to explain the rise and fall of races and empires, have a sort of 'hidden threat' lurking about, provides a secret history of the world, makes the world pretty creepy underneath the surface, and certainly makes it feel very old when I think and talk about it. Now that the Big Ideas and a framework of history was in place, time for more detail, which will be my next post. Labels: Rolemaster, world building, Worldbuilding and You! This past Saturday I hosted my very intermittant Champions game. All of the players were introducing new characters and we were adding 2 new players. All the layers are teens or close enough, so I was prepared to have a ton of fun. Senor Iago and Flaming Hammer were in Atlanta because of the Temporal Displacement Research and Treatment Center at ICICLE Tower, near the CNN Center [ICICLE (Intergovernmental Committee on International Criminal Law Enforcement) is the SHIELD/UNTIL/UNCLE/etc of my campaign)], Tombstone's RV pierced the dimensional barriers near Atlanta because of events related to the last session. Mandible and Speedre came out of local high-tech labs. Ellipses and Thunderclap are from the 'local high-tech scene' in Alpharetta. Xianke won't tell anyone why he is here. Bob Perkins, who just got back from the Sagittarius Dwarf Spheroidal, isn't really sure why he's here. The session started with some of the heroes learning that there was something falling from space into Atlanta. The various heroes, who had not yet met, converged on the CNN Center, the estimated impact point. Thunderclap saw the impact from a distance - whateveritwas landed in the intersection between the CNN Center and ICICLE Tower. Flaming Hammer and Iago saw the impact and donned their armor. Ellipses and the rest also heard or heard of the impact and began to close in. The various supers are all there or almost there when everyone hears a sonic boom and sees a vapor trail heading towards them. A moment later the Brute lands in the intersection! The only creature on Earth labeled an Omega Level threat, the various rookie supers collectively hold their breath. and just then - an energy bolt fired from the ICICLE Tower strikes the Brute, which promptly triggers his Berserk and its time for combat. -Bob Perkins drains the Brutes strength: after defenses 1 point is drained, which is enough to trigger another berserk. Did I mention that each berserk triggers a strength boost? "Sir, I do not know you, but I ask you to calm down. None of us are your enemies; none of us hurt your friend. We are good people made afraid by our anger. I beseech you to cease fighting and we will help find the people who killed your friend." And he rolled really well, giving the brute a chance to try to recover from one of the berserks, which he did. Everyone goes to post phase 12 recovery. Bob Perkins also makes a Presence Attack to try to calm down the Brute, as does Iago, again. The Brute is rapidly calming down! ...snipe Xianke, knocking him out with a mostly invisible beam. ...a filthy Commie! [Flaming Hammer still has red stars and the hammer and sickle on his armor) Originally a soldier in a much hotter Cold War Tombstone draws his "pistol" (a 3' long cannon) and fires on Flaming Hammer. He hits but Flaming Hammer can take it. The Brute then glances around before hurling Thunderclap north. There is a sonic boom as she vanishes toward Dalton. Speedre (who has been holding her action) sprints off at her overdrive speed, hoping to catch Thunderclap on the way down. And the Brute leaps away to the East, also causing a sonic boom as he goes. At this point Mandible steps between the various PC heroes who have been (or are about to) fighting each other c\and calls for calm. The 7' tall cockroach man succeeds in reasoning with everyone and various mutual introductions and apologies are made. At this point Bob Perkins wants to know where the closest McDonald's is. 3 blocks down Marietta Street later and the heroes are all eating big macs and talking (Thunderclap picked up the tab; Bob had lost his wallet on a planet near the Garnet Star a few weeks before). After a few minutes two Icemen (ICICLE investigators) arrived and began to debrief the heroes. A few minutes after they left a young man in the uniform of a Star Ranger arrived: the staff had picked him and he was there to recover the body of his predecessor and return to the local Star Ranger base for training. The group assisted him in getting the body and he then vanished into the sky. The heroes exchanged various methods of contacting each other (except for Bob. He said he tends to be where he's needed). Bob vanished into thin air as he was about to bite into his 4th big mac and everyone else was soon heading home. I was a little pleased with how much fun this intro session went!